Well after three opening one-sided games, we finally got a contest in the Ulster Football Championship. Granted, it's unlikely we were looking at teams today who are going to be involved in the business end in Ulster let alone the All-Ireland series, but we happily settled for a passionate derby battle that was up for grabs right until the final kick at Pairc Esler. You can read more about where the game was won and lost in our match report. We're back on text commentary duty at next Sunday's final Ulster quarter-final between Cavan and Monaghan at Breffni Park. We hope you join us again then. "The game plan we set out, we stuck to it very well although we had a couple of setbacks in the first half with the Armagh goals. "In the second half when Armagh came at us very strongly, we were very disciplined and very organised and very strong in the tackle. "Before we went out, we asked the boys to battle hard and they did that." Quote Message: We want to see passion on the field and we encourage a certain amount of it but those scenes near the end went on far too long. They didn't look good and were just silly. We want to see passion on the field and we encourage a certain amount of it but those scenes near the end went on far too long. They didn't look good and were just silly. "We dedicate that win to the Down players who fell against Armagh. We got the right men on the ball in the second half and the guys who came on, people like Barry O'Hagan and Dave McKibbin, did brilliantly for us." Quote Message: Eamon Burns has taken a lot of flack over the last year and I gave him quite a lot of flack but he got his tactics right today. Today is about him and he deserves a lot of credit. Eamon Burns has taken a lot of flack over the last year and I gave him quite a lot of flack but he got his tactics right today. Today is about him and he deserves a lot of credit. Quote Message: Down were by far the better team today and totally deserved their win. Down were by far the better team today and totally deserved their win. Quote Message: Down produced a very manly performance today. After all they have gone through over the past couple of years, you have to give them a lot of credit. But from Armagh's perspective, it is going to be very hard to regroup from this defeat. This one will really hurt as they completely fell away in the second half after looking so dangerous in the first half. Down produced a very manly performance today. After all they have gone through over the past couple of years, you have to give them a lot of credit. But from Armagh's perspective, it is going to be very hard to regroup from this defeat. This one will really hurt as they completely fell away in the second half after looking so dangerous in the first half. After tempers eventually calm, Jamie Clarke knows he has to go for goal from the 13-metre free but his effort flies over the bar as Down's entire team are massed near their goal-line. There is time for one more high ball to be lumped into the Down square but the home side hold on for a deserved win. Several players from both sides square up to each other as an unseemly bout of wrestling breaks out in the final seconds of the contest. 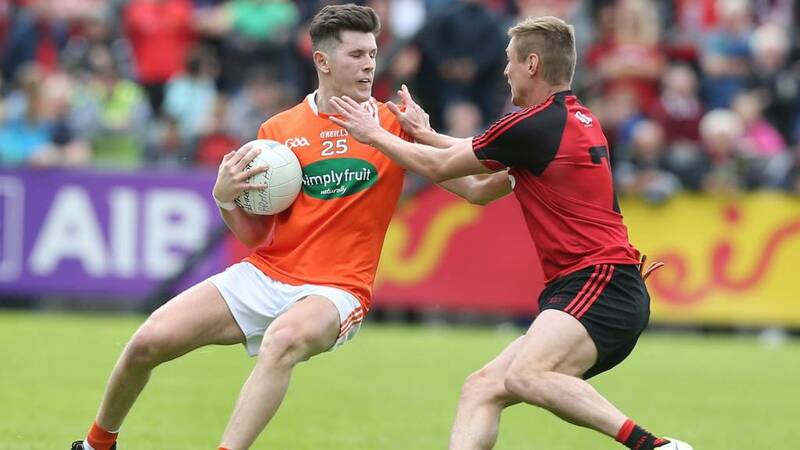 That happened after Down's McKernan blatantly hauled down Armagh's Niall McParland. McKernan duly receives a black card and and several other yellow cards are dished out. Referee Conor Lane initially flashes a red card at Armagh's Joe McElroy but then changes his mind. The referee appears to have mistakenly thought that McElroy had earlier received a yellow card. Down sub Dave McKibbin points a free to restore the margin to three again. We're in the sixth minute of injury-time. Niall McParland points an Armagh free in the fourth minute of injury-time. There has been a delay of nearly two minutes in injury-time because of an injury to Down's Kevin McKernan so we could have another three or four minutes of action. Two between the sides. Frantically chasing a goal, Armagh take a quick free but Brendan Donaghy's weak shot is gathered easily by Michael Cunningham. We're in the second minute of five in injury-time. What has happened to Armagh in the second half? Aidan Forker hits the side netting from close range after they attempt to walk the ball into the net. Moments later, Jamie Clarke and Niall Grimley are both off target with attempts at points. Two minutes of normal time left. Down still three ahead. After a couple of bad Down misses, Barry O'Hagan strokes over a fine score from near the right sideline to increase the Mourne County's lead to three. A big fist pump shows what that score meant to the substitute. Seven minutes left. Darragh O'Hanlon has a free from 35 metres to increase Down's lead to three again but pulls his shot badly wide. Armagh have lost their way but Down are squandering opportunities to take firm control of the game. The Orchard County have scored one point in the opening 24 minutes of the second half. Down debutant Anthony Doherty is black carded for a hand trip on Jamie Clarke. Niall McParland replaces Doherty. Andrew Murnin netted Armagh's second goal and was also inches away from another three-pointer just before half-time. Substitute Anto Duffy strokes over a vital point from Armagh to cut Down's lead to two. A delay then follows as Down's Niall Donnelly suffers a leg injury after Niall Grimley accidentally steps on him following an aerial duel.